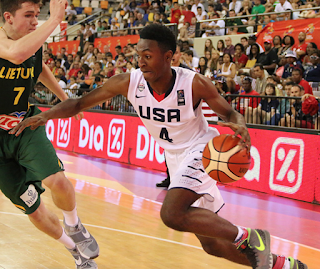 Quickley is a gamer, a competitor, a hard worker and an ultra talented lead guard who makes those around him better. He's a super savvy player who seems to play one step ahead of everyone else on the court. Quickley is a true lead guard who is at his best with the ball in his hands, penetrating the defense, setting up teammates or creating for himself off the dribble. He's got good speed and great ability to shake defenders off balance. He plays the game like he's listening to great music, showing rhythm, change of pace and creativity with the ball. His change of pace dribble and suddenness allow him to get into the lane against most defenders and he can score with either hand and can hit circus shots against length. He's a smooth and accurate shooter (but...see Cons, below) who can really keep the defense honest with his three point shot. He's got the size and quickness to lock it up in man to man D, sliding his feet well and getting low in his stance. He's pesky, always looking to get after the ball, and he can turn defense into offense in a hurry. He also pushes the ball well off of rebounds and made shots, playing with pace and putting constant pressure on the defense. His half court game is polished for a young lead guard. He can operate out of the pick and roll and is a good decision maker with the ball. Quickley lacks ideal form on his jumper and doesn't have an especially quick release. He's a bit thin and doesn't have a ton of natural strength. He's a good but not great leaper and is a step below players like De'Aaron Fox and John Wall in terms of athletic ability. Built in the De'Aaron Fox mold, Quickley might not be as fast as Fox but he does a lot of the same things. He's also got some Patrick Beverley in his game.